The fast AF NIKKOR 180mm f/2.8D IF-ED has proven itself a stellar performer in low-light situations where capturing distant action is crucial. It’s fast f/2.8 maximum aperture delivers beautiful background blur and versatile low-light capability. A favorite among astronomical photographers, photojournalists and portrait photographers, it’s also fantastic in sports arenas and concert halls. A favorite of astronomical photographers, the AF NIKKOR 180mm f/2.8D IF-ED is also well-suited for close portraits, short-range sports, theater photography and more. So whether you're interested in capturing the beauty of nature’s most elusive phenomenons or the exciting fast-pace of a sporting event, bring the action closer in exquisite detail and clarity. 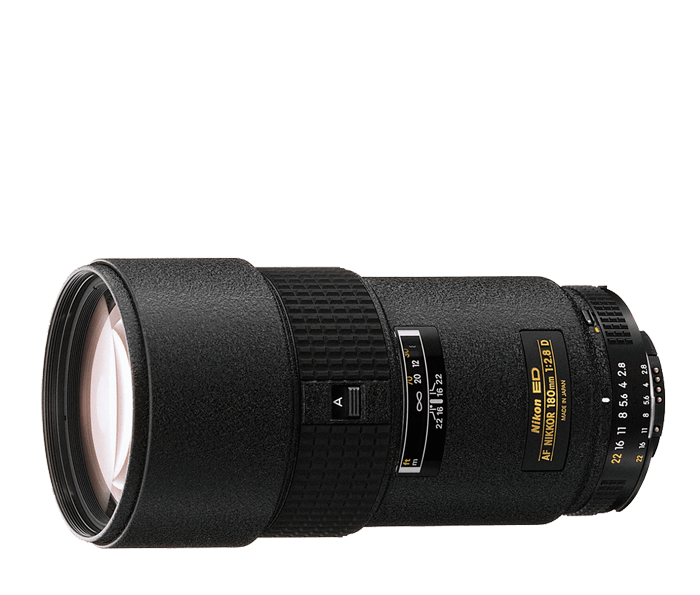 Remarkably compact and easy to handle for such a fast medium telephoto, the AF NIKKOR 180mm f/2.8D IF-ED incorporates Nikon’s renowned Extra-low Dispersion (ED) glass to compensate for chromatic aberration and deliver crisp, high-contrast clear images, even at the maximum aperture of f/2.8. Expect brilliant images every time.